World Metal, LLC announced that it has successfully passed its NACD Responsible Distribution® verification for the current three-year cycle, reaffirming the company’s commitment to the health, safety, and security of its employees, communities, and the environment. Responsible Distribution is the National Association of Chemical Distributor’s (NACD) third-party verified environmental, health, safety, and security program that allows members to demonstrate their commitment to continuous performance improvement in every phase of chemical storage, handling, transportation, and disposal. The Responsible Distribution program requires on-site, third-party verification of facilities against a set of guiding principles, including strict adherence to laws and regulations and participation with interested entities in creating responsible laws, regulations, and practices to help safeguard the community, workplace, and environment. Participation in Responsible Distribution has significant benefits, including lower instances of safety and environmental incidents, better documentation of company policies, better communication with local communities, reduced audit time and costs, and increased credibility. 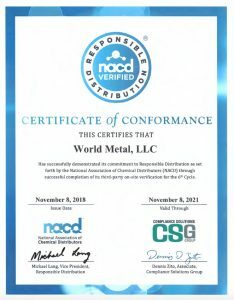 To learn more about Responsible Distribution, visit www.nacd.com/rd/about/.